When choosing how to shred your documents you will want to consider shred size. 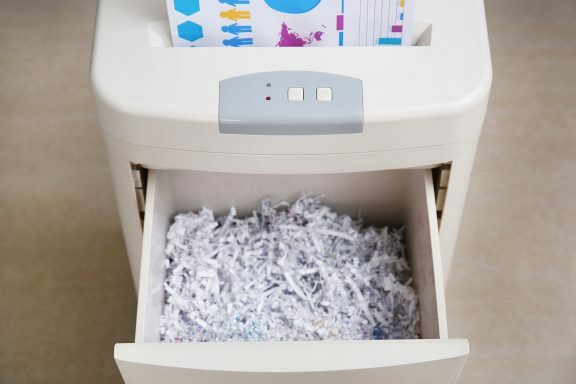 The size of the paper shreds affects information security and possibly the cost of your service. Watch the video or read the transcript below for more in depth information on the different shredding sizes available and what to expect when you shred your documents. As of 2018 there are seven different shredder security levels, known as levels P-1 through P-7. With the “P” standing for paper-based materials, each P level corresponds with a different size of paper shred. The different standards are laid out by DIN 66399, which details the maximum area and width of shred particles along with guidance on the best level for different types of sensitive information. As a strip-cutter a P-1 shredder produces paper strips that are ≤ ½” in width, and because of their large size the throughput is high. 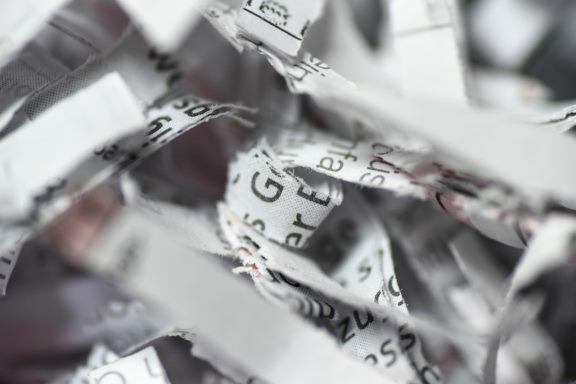 While they’re fast, the paper shreds form a P-1 shredder can be easily reconstructed, making them better geared for less sensitive information. With P-2 shredders the strips are required to be ≤ ¼” wide, but besides the size there aren’t many other differences. While the smaller size gives a minor leg up on security, a P-2 shredder can carry risks because of the shred sizes and the amount of potentially sensitive information that could still be legible on a single strip. A level P-3 shredder is the only type of strip-cutter that produces small enough shreds to satisfy compliance requirements for laws like HIPAA and FACTA. P-3 paper strips are only ≤ 2 mm wide, and because of the speed of strip-cut shredders, level P-3 is often favored for its balance between the ability to shred in high volume while still staying secure enough to meet legal requirements. Crossing the boundary from P-3 to P-4 is more than just a security boost—it’s a shift towards an entirely different approach for how to shred documents. Instead of basic strips, level P-4 includes cross-cut shredders that cut papers twice to produce much smaller shreds only ≤ 160 mm² particles with width ≤ 6mm. Because of the small size reconstructing cross-cut shreds is difficult if not impossible, making P-4 shredders ideal for shredding sensitive information like PII. Level P-5 sits as an in between—it provides more security with cross-cut shreds that are only ≤ 30 mm² particles with width ≤ 2 mm, but they’re no small enough to meet NSA requirements for destroying classified information. Because shredders get slower as the paper shreds get smaller, a P-5 shredder is ideal for someone who prefers extra security over the speed of a P-4 shredder. Level P-6 cross-cut shreds are only ≤ 10 mm² particles with width ≤ 1 mm, but like a P-5 shredder a P-6 is still not enough to meet NSA guidelines. As a result P-6 shredders fall in the same in-between category as a P-5—while they’re ideal for security-conscious organizations, a P-6 shredder is slow and will struggle with high volumes. Level P-7 is the most secure shredder type available, with shreds of just ≤ 5 mm² particles with width ≤ 1 mm so that a maximum of only 4 character can be seen on a single shred. A P-7 shredder is the only type of shredder that meets the NSA requirements for shredding classified and confidential information. Although level P-7 provides maximum security, it is important to note that P-7 shredders are the slowest, with an average of only being able to handle 10 sheets per pass. Does Your Shredder Meet All Security Needs? Shred Nations partners with hundreds of secure, independent shredding service providers across North America. 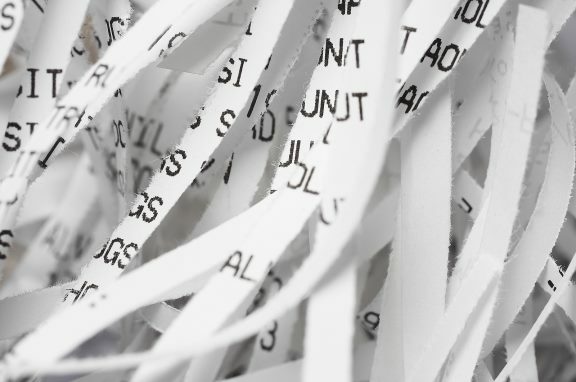 We can help you find a document shredding service that meets your security requirements. Call us today at (800) 747-3365 or fill out our form to get free quotes on secure paper shredding services near you!